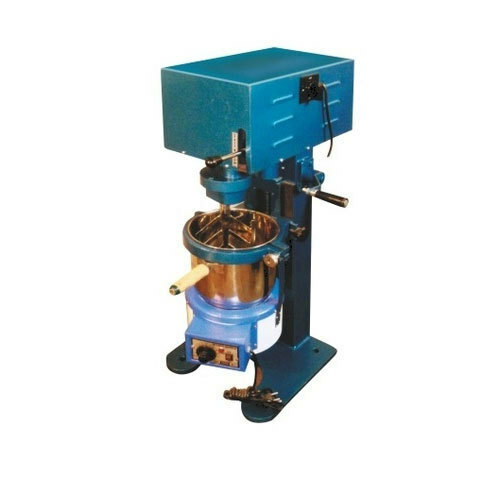 A 6-litre Mixer Used in conjunction with an Iso Mantle, is suitable for mixing samples of asphalt. Bench mounting Mixer, 6 liter nominal capacity. Supplied with bowl, beater and whisk. Motorized with two speed operated. A 6-litre Mixer Used in conjunction with an Iso Mantle,is suitable for mixing samples of asphalt. Bench mounting Mixer, 6 liter nominal capacity. Supplied with bowl, beater and whisk. Motorized with two speed operated. Zeal International is a leading pioneer for manufacturing & supply of Testing Equipment for construction building material since 1996.Always having a wide vision to Develop & Design equipment’s with modern technique a team of engineers are on continual endeavor & innovation. Zeal is exporting its equipment in the brand name “LABTEST” to around 42 countries directly & also through authorized dealers and representatives. We also supply Special purpose machine adhering to International Specification such as (BS En, ASTM, AASHTO, DIN, NF, IP, BIS).Apart from our wide range of equipment such as Soil Testing in the Field; Lab Tests for Soil; Geo-technical testing; Fresh Concrete Testing or Strength Testing; NDT for Concrete; Cement Testing; Asphalt Testing; Testing Aggregate properties, Steel Testing & General Laboratory Equipment. The Company follows the Standard Quality Management System as mandated for its registration with ISO 9001:2008 certificate. Our main clientele consist of major Construction companies carrying our Road & Highway construction, commercial buildings & high scrapers, Rail Infrastructure & Bridges, Oil & Gas, Dams & Hydro Projects, Civil Engineering Colleges, Mining Industry & Irrigation sectors. Zeal International is always engrossed to give its clients continuous sales and service support as this had always been an investment to build a brand value in both domestic and international markets. All products are carefully handled through our quality management system to meet it as per standard specifications. Testing and calibration at each step is performed before final packing and dispatch from our warehouse to the designated consignees. Since inception, what has changed, is the diversification of our Product Range. What hasn't changed, however is our commitment to precision and quality, because every micron counts in our business! We hereby proudly present The 10th Edition of detailed user-friendly Catalogue including New Sections with Additional Products. ZEAL INTERNATIONAL – Commitment to Its Customers The name Zeal International is recognized throughout the World for its pioneering work in the range of Material Test Equipment. Our Unique Services Include Advanced Design and Development to the Highest Quality, full Technical Advice and Support on Customer's Requirements, Equipment Quality and Timely Deliveries at an Affordable Price. Products listed in the Catalogue…and that means that, in most cases, we can Ship as we get Your Order. To provide a Standardized & Environment Friendly Equipment with the Perfect Blend of Quality, Pricing, Packaging, Delivery & it’s After Sales Support. Zeal International's Dedication towards its Customers is the Rich Heritage of the Company which continues today and will be fostered in future as well. Both Customer & Vendor Satisfaction makes an equilibrium in the market Expand clientele base & dealer/Representative network in both domestic & international markets To be in the Top 5 companies in Material Testing Industry In India in next 5 years.